Please refer to our stock # 7007 when inquiring. Decorated with mica and colored glass pieces and in incised fashion, and mounted on a teakwood base. 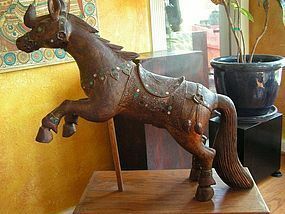 I believe the horse dates from the first half of the 20th century. Provenance: Acquired in 1970. Measurements: 27" high and 28" long, without the base.